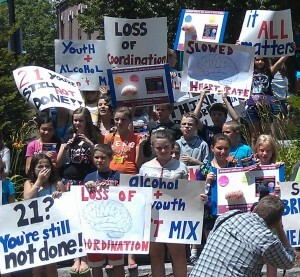 In the summer of 2012 Dover Youth to Youth unveiled the Brain Campaign. The goal of this campaign is to make everyone aware of the effects of underage drinking and how it can affect every part of your brain. Y2Y also wants to make people aware that alcohol affects young brains more severely. 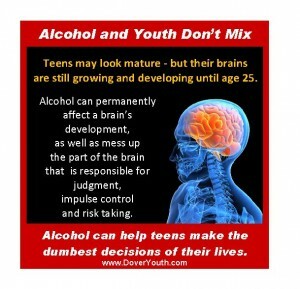 Youth to Youth started off researching the effects of alcohol on the brain. Students found that until the age of 24 or 25, the brain is still growing and is more susceptible to the affects of alcohol. They also found that alcohol impacts every region of the brain and the effects on those regions leads to many of alcohol’s consequences. Many people see the only risk of drinking by kids (and adults) as the risk of getting “tipsy” and becoming a dangerous driver – due to the effects on the brain’s regions controlling balance, coordination and reflexes. The public often forgets about the consequences of underage drinking that relate to affects on the brain’s parts that control breathing, memory, learning, and impulse control or judgment. Alcohol affects the part of the brain that controls balance and coordination. But it doesn’t just affect that part of the brain. 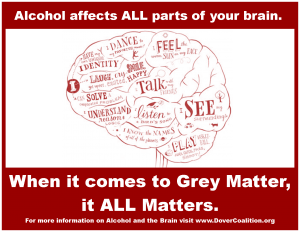 For example, alcohol impacts the part of your brain called the prefrontal cortex (the part that makes judgments and says “I really shouldn’t do this…”). When this region is affected by alcohol – the result is often bad judgments, bad decision making, and risk taking. In addition to the harm that alcohol causes to the brain, research shows that the younger a child starts drinking alcohol, the more likely they are to have a drinking problem or alcoholism later in life. 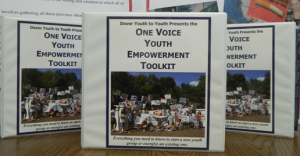 Dover Youth to Youth launched the Brain Campaign by holding an informational demonstration in downtown Dover, NH with palm cards (see photo), posters, visuals, chants, and conversations with pedestrians. The Brain Campaign was kicked off during our week long summer Advocacy Camp that teaches advocacy and activism skills to new members interested in participating in Youth 2 Youth. Youth to Youth created a simple handout called the 8 Consequences of Underage Drinking. This list forms the basis for training conducted during DARE classes in the 5th grade and parent classes conducted during the school year. The rain Campaign is also supported by presentations of the 7th grade assembly called 8 Things. As part of our Brain Campaign, we also created a new adhesive sticker (see photo) that was used in our Sticker Shock project.